Losing a tooth or teeth to accident or decay is one of the hardest things many people face. Questions of how to repair the damage and concerns about the pros and cons of traditional dental bridges and dentures is enough to keep a person up nights. The good news is conventional tooth replacement options aren’t the only choice anymore. More and more people are choosing dental implants over the dentures and bridges of yesterday. Dr. Miller and his experienced team have plenty of experience helping patients restore their smiles and dental health with these appliances. The process is fairly straightforward. The damaged tooth or teeth are removed and custom made implants are made in the dental lab. The implants are created to mimic the shape and color of the original tooth to ensure the most natural appearance possible. The implant is then permanently placed. Dental implant restoration is ideal for treating only the affected, damaged teeth. Adjacent healthy teeth aren’t impacted by the procedure. The average healing time is a couple of days to two weeks, depending on variables such as the patient’s overall health and age. With dental implants, patients have a great deal more freedom than with bridges and dentures. 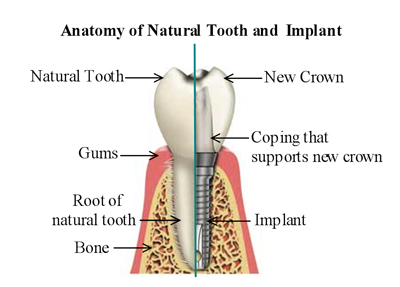 The implants require the same hygiene routines as natural teeth. Patients also don’t have to concern themselves with the possibility of slipping dentures or food becoming painfully lodged under the appliance. If you feel like dental implants could be right for you, call and schedule a consultation with Dr. Miller and his staff.